All popular browsers have the feature called a login manager (or a password manager). 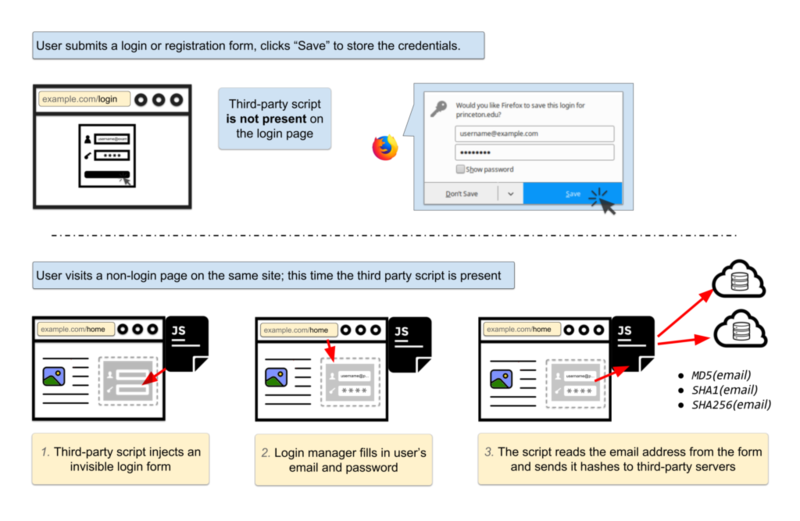 It allows a user to input the login and password on a certain site once, let the browser save them, and later have them autofilled on the same site when authentification is required. Tracking scripts work on a website's pages that do not contain a login form. They fake such form. It is invisible for a user, but a browser "sees" it and fills it with a login and password. More often than not the login is an email address. "Email addresses are unique and persistent, and thus the hash of an email address is an excellent tracking identifier. A user’s email address will almost never change — clearing cookies, using private browsing mode, or switching devices won’t prevent tracking. The hash of an email address can be used to connect the pieces of an online profile scattered across different browsers, devices, and mobile apps", the researchers say. They emphasize that a hashed email address is not an anonymous identifier, so the technique described above violates privacy. The two ad tech companies that benefit from this scheme are Adthink and OnAudience. Analyzing the script made by AdThink, the researchers were impressed by the categories it contains. "It is hard to comment on the exact use of these categories but it gives a glimpse of what our online profiles are made up of", the experts say. This is yet another proof of the fact that an ad blocker is nowadays not a luxury but a means of self-defense. CITP experts also recommend using an ad blocker or some other app that disables tracking. As a Big Data company, we do our best not only to collect sufficient amount of data about internet users but also to protect their privacy and security. As it is clearly visible in our scripts we are not gathering e-mail addresses or passwords. In fact we collect anonymous e-mail shortcuts generated by well-known and widely used hashing algorithm. This method is commonly used in modern marketing automation platforms and is supported by the leading ad technology providers. We used them for the sole purpose of e-mail retargeting using double opt-in mailing lists on behalf of our customers. In this case the script was gathering data for our legacy platform BehavioralEngine.com. Our DMP OnAudience.com is a completely different technology and uses other methods to gather information. Moreover, there is no exchange of data between BehavioralEngine and OnAudience. All data gathered by our DMP is automatically anonymised and processed in real time by its machine learning algorithms to ensure the highest precision in ad targeting and other marketing activities carried out for our clients. Digital information available in our data warehouse is never combined with any data, that would allow crackers to identify people online. Since we started our activity there has never been any incident of that sort although we process over 9 billion anonymous profiles of Internet users from around the globe.